The Buffalo Bandits made a big push towards the playoffs on Friday night with a 20-7 win over the New England Black Wolves at Mohegan Sun Arena. Twelve straight second-half Bandits’ goals crushed the Black Wolves, who just couldn’t win a face-off or even hold possession once they got it. Stephan Leblanc put New England on the board at 1:05 of the first quarter. Vaughn Harris answered seven seconds later. Mitch de Snoo put Buffalo ahead at 7:19 but Callum Crawford’s wrap-around from behind the net tied the game at two at 8:04. And that was when the Black Wolves relinquished control and let Buffalo dictate the pace of the game. Jordan Durston scored a power play goal, and Mitch Jones scored a pair 36 seconds apart to give the Bandits a 6-2 lead after the first quarter. Jones completed his early hat trick on a power play in the second. Harris’ second goal led the Bandits to an 8-2 lead at halftime. New England fought back in the opening minutes of the third quarter, with consecutive goals from Leblanc and Colton Watkinson, who scored on transition for an 8-4 score. Buffalo then went on to score 10 goals in a span of less than 10 minutes. Jones added goals four and five. Dhane Smith potted two in the frame. Shawn Evans scored against his old team. And captain Steve Priolo had the goal of the quarter, picking up the loose ball after Kevin Brownell was flattened in front of the net. Priolo quickly flipped a backhand past Aaron Bold. Bold was lifted in favour of Doug Jamieson for a spell in the third, but after four goals Bold went back in. A fourth quarter hat trick from Kevin Crowley kept his 30+ game goal-scoring streak alive but did nothing to help the Black Wolves, who, by that point, just looked relieved to get the game over. The Bandits scored three power play goals as both teams fought some late-game nonsense. Tempers flared although only one true fight occurred as Mitch de Snoo dropped the gloves with Reilly O’Connor, who crumpled against the boards under the speed of de Snoo’s fists. Despite dominating O’Connor, de Snoo went to the box dripping blood from his forehead. Craig England mixed it up with Derek Suddons, and Mark Steenhuis tried to get at a couple of Black Wolves, including his summer teammate Kyle Buchanan. When all was said and done, Vaughn Harris emerged as the game’s star with four goals, four assists, 15 loose balls and 20 face-off wins on 29 attempts. Mitch Jones had five goals for the Bandits. Dhane Smith (2G/6A), Shawn Evans (2G/4A) and Jordan Durston (2G/3A) also had big games. Alex Buque stopped 40 shots in what may have been his best game as a Bandit so far. A couple of Bandits reached milestones in the game, including rookie Josh Byrne who set the team record for rookie points after his one goal, three assist performance brought him to 51 points. And equipment manager Teddy Cordingley worked his 200th NLL game, and was fittingly awarded with the game ball. With only half a game separating first from last in the NLL’s east division, every win right now is crucial, and the Bandits, who have seen both first and last place this season, made a statement that they want to stay at the top. 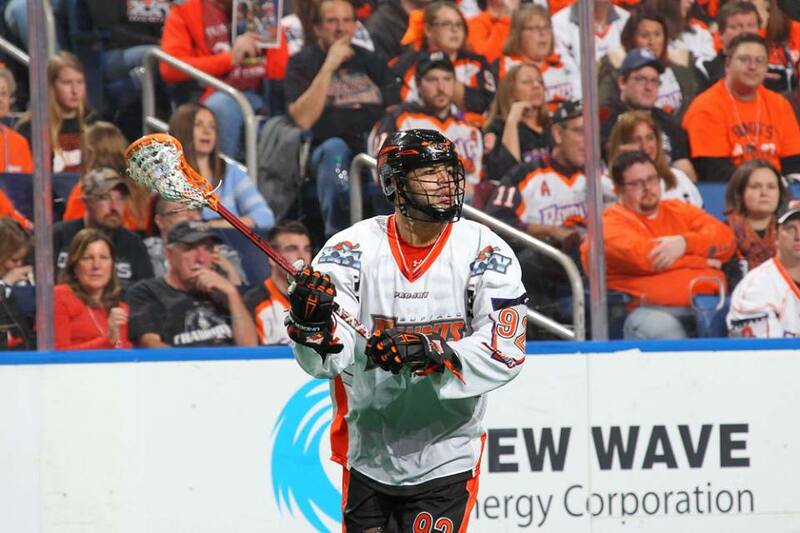 The Bandits are now off until next Saturday when they host the Black Wolves at Key Bank Center. The Wolves are right back at it tonight in Georgia, taking on the Swarm at 7:05 p.m.
Of note: Buffalo was seven for 10 on the power play, while New England was zero for four.